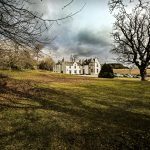 Originally built in 1756, Saplinbrae Hotel and Lodges showcases the best in country living and relaxed dining, where the quality of service and commitment to consistency is excellent but still personal and fun. 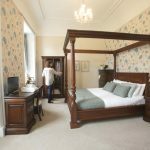 All of our nine bedrooms have historic charm, which we have complemented with local art and small touches of tweed from our local mill. They are a fitting counterpart to the spectacular views from your window of acres of uninterrupted, rolling farmland. 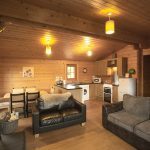 Our two self-catering wooden lodges come complete with three bedrooms, kitchen-living area and wood burning stove. They are ideal for busy families and are dog friendly too! The hotel dining room offers relaxed dining. Having a strong agricultural connection within our team, we deem the provenance to be of the highest importance. We always source from Buchan, Aberdeenshire and Scotland as far as possible—our fish comes from suppliers in Fraserburgh, Peterhead and Sandend, our beef from Foveran and much of our pork and lamb from our own family farms in Kininmonth and the Black Isle. We serve lunch and dinner daily from 12.00pm and 6.00pm, and you can pop in past for a slice of carrot cake and a coffee or a warming bowl of soup anytime.